Yesterday, I said that I had a habit finding Indie darlings on the tail end of my list. Not to spoil anything, but this year proves to be no different. We’re so spoilt for choice when it comes to video games these days, that you could be perfectly happy only ever playing games out of smaller studios and never getting into the AAA, there are a lot of people who do just that. Today I’m going to talk about a game I spoke about early in the year. I had to pick this game up when I heard who was developing it, despite it only being their second game. But even in writing this piece, I found myself with the itch go back and start playing it all over again. It’s a game I can see myself going back to over and over, just like I did with the developer’s first game. There’s something about Subset and their games that satisfies some deep itch within my brain. They create fascinating worlds and games using rather limited means, and then execute them brilliantly. 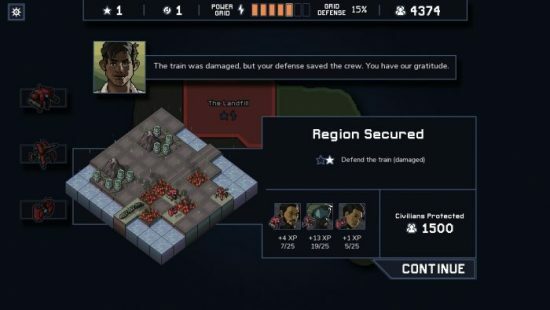 I gave a glowing review of Into the Breach shortly after it came out. 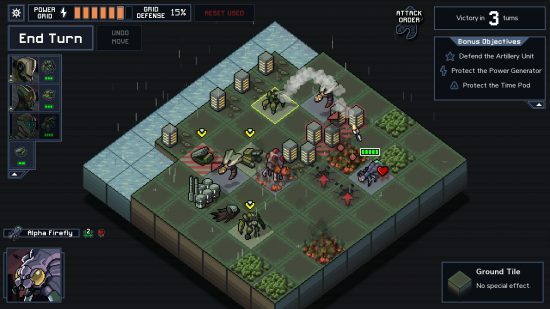 It feels like a game in which the mechanics were the base line and then the story and setting were created to suit its mechanics, with influences from a ton of science fiction, including Pacific Rim, Starship Troopers and The Terminator, it was inevitable I was going to love this game as much as I did FTL. 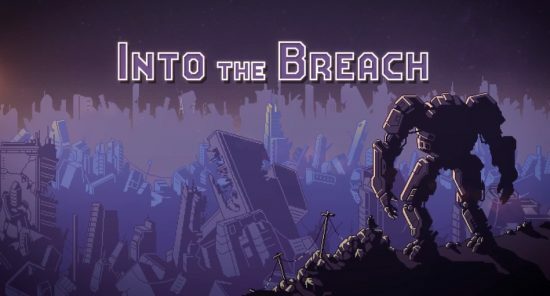 Into the Breach is a turn based strategy game made with the simple idea that giant robots should probably avoid causing collateral damage at all costs. Set in a sparsely populated world in which the seas have risen and colossal insects are attacking what remains, teams of mech pilots travel from island to island, defending the settlements while working to exterminating the bugs from the timeline. Oh, did I forget to mention, there’s time travel too. Succeed or fail, the pilots are doomed to repeat the cycle over and over again, jumping from timeline to timeline exterminating the bugs from all of them. One of the best things about Into the Breach is that it obscures nothing from you, it lacks any randomness when it comes to combat, meaning all of the cards are in your hands. Between each turn the game shows you exactly what each enemy is going to do, how much damage it’ll cause and in what order. So gameplay becomes much more like a game of chess. It’s a puzzle, in which you have three different mechs with varying abilities depending on which team you’re playing. So you need to make the tough choices, how you’re going to manoeuvre yourself and your enemies to stop them damaging both you and the power grid. Or if you’re going to have to sacrifice one of your pilots to defend the cities. Like FTL, you start off with a basic team and hero pilot. As you play, you gain access to more teams, each based around each of the game’s status effects, as well as different heroes with innate abilities, one of which you can follow through the timeline into a new game. Playing a repeatable game with varying goals like this is always something that hooks me. Giving me the goal of not just getting to the end, but doing it with a tertiary goal. Into the Breach is a really cool game. One I found myself going back to whilst writing this list. I really hope that Subset go back and add some more content to it down the road like they did with FTL. It’s a perfect example of implied story telling, how less can sometimes be more. Not just that, it takes all of the best things about FTL while doing away with the negative aspects. Since I played the game, it found its way onto the Switch. One more reason for anyone intrigued by this to go out and pick it up. 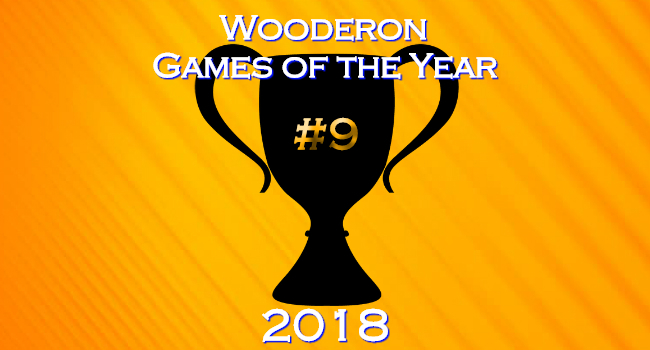 Posted on December 22, 2018 December 16, 2018 by WooderonPosted in 2018, Best of Year:Tagged ftl: faster than light, game of the year, goty, into the breach, strategy game, subset games, Turn-based strategy.